Our desire to provide quality military Display Case is rooted in a long history of service to our Nation's veterans, Active Duty personnel, National Guard and Reserves. Mike served in the U.S. Navy from 1967 to 1971. His first tour of duty was with the Mobile Riverine Force – Task Force 117 in Vietnam. He was a Radioman/Machine Gunner with River Assault Squadron 15/River Assault Division 152. He earned a Bronze Star Medal w/V, Navy Achievement Medal w/V, Presidential Unit Citation, (2) Navy Unit Commendations along with several other awards. His second tour was at the Naval Communication Station, Guam where he earned the Meritorious Unit Commendation. Connie's first husband, Freddy D. Breeland, was Mike's best buddy in Vietnam. Freddy was also a decorated hero who received (2) Purple Heart Medals. Freddy and Mike lost contact with each other after their tour on the riverboats. Then 16 years later Mike finally made the right connection. They had a grand reunion at Freddy's home north of Natchez, MS. Sadly, six months later Freddy was killed in a single car accident. Mike tried his best to support Freddy's wife and 13 year old son spiritually and financially following the loss of their husband and father. Months went by and one day Mike asked Connie to marry him. He helped raise Freddy's boy and now he and Connie have been married for almost 25 years. Five years were spent as Christian Missionaries in S.E. Asia. Over the past decade Mike, as a disabled veteran himself, has been assisting his fellow veterans as an accredited Veteran Service Officer with Vietnam Veterans of America. He has also helped many of them upgrade and acquire their hard earned medals and ribbons. One day we discussed the possibility of providing an added service by starting an online business. "Legacies of Honor" was founded as a result of those heartfelt conversations. 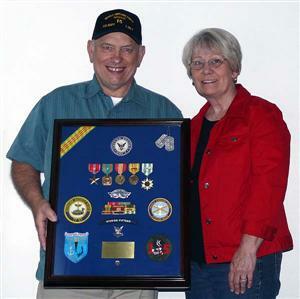 Our goal is to provide quality Shadow Boxes and earn some retirement income now that we are both over 60 and retired. Mike has been a student of military awards for many years now. We are both sticklers for perfection. These two assets combine to help us compose fine looking Shadow Boxes. Why not allow us to provide you with a fair price that will allow you to display your medals, ribbons, rank insignia, patches, etc. with Pride? !